and enjoy a mug size cappuccino every morning (with 3 strong shots). More occasionally I enjoy an espresso as a digestive after a heavy meal. so I've decided a stovetop coffee maker is required for travel. but am wondering if the extra investment for the Brikka is worthwhile. but am unsure of size and model, any tips or advice? I used one of them at home for a number of years. Mine was on the larger side and I wouldn't want to pack it in. I switched to tea a number of years ago. Tea bags are much easier to carry than a coffee maker. When I was looking for one to take camping, I gave a lot of thought to something like the link below. I've always been intrigued by the brikka. But I've quit drinking coffee, loose leaf tea has taken its place. If you like the real "espresso" then the Moka may disappoint you, because it makes a waterish coffee with a very peculiar taste. If you're American, go for it It makes a "long" coffee, not very concentrated,but not bad. 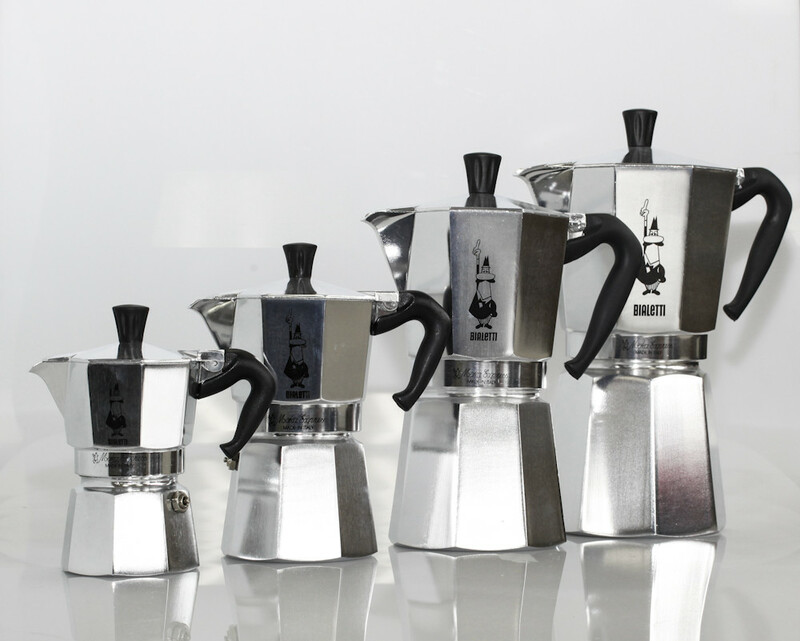 In Italy there's not a single house without a Moka in it. The smaller is enought for one or two normal servings. If you're American and drink a whole mug then go with the second from left. I have used many stovetop / campfire percs over the years, most of which were family hand-me-downs or something you might see in an antique shop (or even an army surplus / camping store). They all make a great cup of coffee (for my tastes), but the real trick is learning your ratio of water to grounds. Campfire coffee will get stronger the longer you cook it, so it's all up to you. I like my coffee strong enough to serve by the slice. (05-29-2013, 02:50 AM)MrDentini Wrote: If you like the real "espresso" then the Moka may disappoint you, because it makes a waterish coffee with a very peculiar taste. If you're American, go for it It makes a "long" coffee, not very concentrated,but not bad. 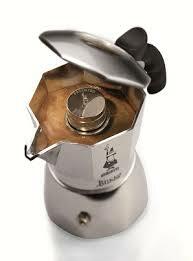 In Italy there's not a single house without a Moka in it. Thanks Marco, I've read that using sparkling water instead of still in the Moka can aid in achieving crema... ? A watery coffee is not something that will satisfy me. I like a rich, robust shot. I'm guessing the second from the left may be the 3 cup version... ? I'll predominately be using it outdoors (camping) so the risk of exploding I can take. I believe a trick to success with the Brikka may be to turn the heat source off as soon as the pressure has been reached... ? (05-29-2013, 05:32 AM)ben74 Wrote: Thanks Marco, I've read that using sparkling water instead of still in the Moka can aid in achieving crema... ? (05-29-2013, 05:32 AM)ben74 Wrote: I'm guessing the second from the left may be the 3 cup version... ? (05-29-2013, 05:32 AM)ben74 Wrote: I believe a trick to success with the Brikka may be to turn the heat source off as soon as the pressure has been reached... ? Also the coffee grinding is a variable you have to take into account for a good cream. (05-29-2013, 05:40 AM)MrDentini Wrote: Also the coffee grinding is a variable you have to take into account for a good cream. A grind almost as fine as for espresso? inexpensive Wherever percolators were the best and US made. (05-29-2013, 05:48 AM)ben74 Wrote: A grind almost as fine as for espresso? If it won't make at a minimum 10 cups, it is a waste of my time. I'm referring to regular coffee, none of the fancy drinks. When I travel I bring a french press (which is what that looks like) a grinder and an electric kettle. I don't want for good coffee but when I get home I realize how much I've missed the luxury of my espresso machine. The moka pot will make a bitter, though strong, cup of coffee but nothing that resembles what I consider to be a good shot of espresso. I purchased the Bialetti Brikka (4 cup) and the Bialetti Tuttocrema. I am camping with my eldest son next weekend and am looking forward to using them then. (10-25-2013, 04:00 AM)ben74 Wrote: I purchased the Bialetti Brikka (4 cup) and the Bialetti Tuttocrema. Have a great trip Ben. 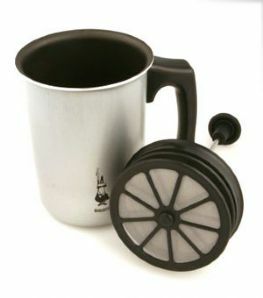 I look forward to hearing which coffee maker you go with and how the coffee (and trip) turn out. We've had real good success with the Aeropress. Ben, for what it's worth........ have been a user of Bailetti StoveTop coffee maker (the three cup version) in the 25+ years I have only ever bought two. I do not sterilise this as I only use one blend of coffee "Blue Montain" in a small coffee can. If I were to change blend or brand I would purchase another. I have been using a Brikka for the last 5 years and have never had an issue. If coffee is getting all over the kitchen, there is either a manufacturer's defect or user error. Go back and read the instructions and give it another go. I think you might have to tighten the valve on the top piece. just hold the bottom piece of the valve and turn the top valve piece clockwise. The Brikka only generates two bars of pressure, so no explosion should ever occurr! Also, do not tamp your ground espresso! Let me know if this helps with your Brikka!